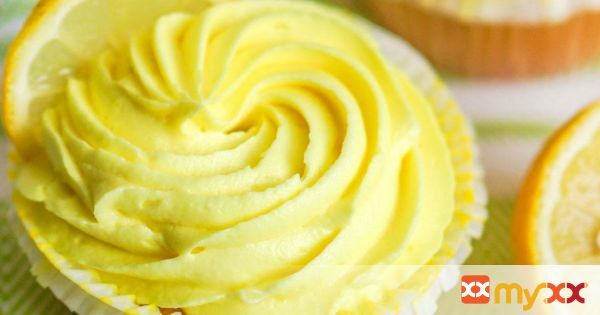 Cupcakes made with lemon curd and fresh lemon peel. 1. Heat oven to 350°. Line 24 muffin cups with paper liners. For the cupcakes combine flour, baking powder and salt in medium bowl. Beat butter and sugar in large bowl with electric mixer on medium until light and creamy. Add eggs, one at a time. Beat 2 minutes. Spoon in flour mixture in thirds, alternating with milk. Add lemon curd. Beat until combined. Divide evenly into muffin cups. Bake 18 to 22 minutes or until toothpick inserted in center comes out clean. Cool 5 minutes. Remove from pan. Cool completely on wire rack. 2. For the glaze combine water, torn basil leaves and salt in small saucepan. Bring to boil on medium-high heat. Simmer on low heat for 5 minutes. Cover. Steep until cool. Strain out basil leaves. Mix basil water, lemon curd, lemon peel and minced basil in medium bowl. Beat in powdered sugar one cup at a time with electric mixer on low speed, until combined. Beat mixture on high speed until smooth and creamy. Place glaze into corner of medium heavy-duty re-sealable plastic bag. Cut small corner off bag. Frost by squeezing glaze onto cupcakes, starting at outside edge of cupcakes and moving toward center in a spiral pattern.